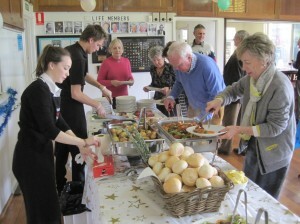 A great lunch yesterday, lasting well into the afternoon, was enjoyed by just short of the fifty guests expected. The room was spectacularly decorated by Penny Gamble and her main assistant Debbie Hurford, (although there was no shortage of helpers joining in), and following some delicious hors d’oeuvres, a fine main course of ham, turkey and pork was served by Spitting Image Catering. It was well up to their usual high standard. This was followed by pudding with ice cream and two sensational sauces prepared by Marty Palmer. (Not bad for a ninety six year old was the consensus). 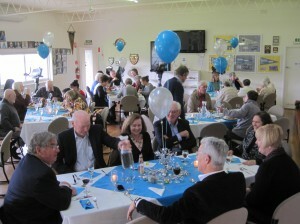 All agreed that the function was socially and gastronomically, a huge success. Thanks to Tony and Penny Gamble, David and Debbie Hurford, Derek de Korte at the bar, and all the usual helpers too numerous to mention. We are gathering for a drink and some fish and chips Friday around 5.30.